Winter Solstice has been celebrated in cultures the world over for thousands of years. Here in the northern hemisphere, nights get longer and days get shorter until (in 2005) December 21 when the cycle reverses. What better time than the start of the solar year to celebrate the cycle of nature and reaffirm the continuation of life? In old Europe, this time of year was known as Yule, from the Norse, Jul, meaning wheel. Ancient rituals -- with fertility rites, fire festivals and offerings and prayers to Gods and Goddesses -- are at the root of our modern affinity for candles, evergreens, feasting and generosity during holiday celebrations. Meditate in darkness and then welcome the birth of the sun by lighting candles and singing chants and carols. If you have a indoor fireplace or woodstove, burn an oak log as a Yule log and save a bit to start next year's fire. Decorate your home with electric colored lights. Click on the candle for some spells & rituals related to growth & new beginnings, and books on spellcraft. We all enjoy exchanging gifts and feasting with our friends and family at this time of year but how about extending this beautiful custom to include the other living creatures who share this earth with us? Put up bird feeders and keep them stocked with seed. You can also make decorative wildbird treats by rolling pinecones in peanut butter and bird seed. This is also a wonderful time to visit an animal shelter and adopt a homeless cat or dog. Donate funds and items to environmental organizations. Meditate for world peace. The four days out of the year that mark the turning of the seasons are especially magical times so dvination of the events of the coming year was and is another prominent feature of Winter Solstice. Tarot, Rune or I Ching readings can be especially significant at this time as can dreams or visions seen in meditation. Winter Solstice is also an excellent time for banishing rituals to eliminate disease, bad habits & addictions. Click on the steaming cauldron for a collection of dessert recipes perfect for celebrating Yule and the Winter Solstice. 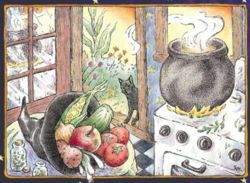 You'll also find magickal associations for some of the ingredients and links to Pagan cookbooks. Each culture has had its own traditional character who visits at the time of Winter Solstice, bringing gifts & treats. 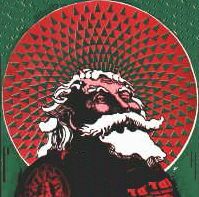 Today's Santa is a folk figure with multicultural roots. He embodies characteristics of Saturn (Roman agricultural god), Cronos ( Greek god, also known as Father Time), the Holly King (Celtic god of the dying year), Father Ice/Grandfather Frost (Russian winter god), Thor (Norse sky god who rides the sky in a chariot drawn by goats), Odin/Wotan (Scandinavian/Teutonic All-Father who rides the sky on an eight-legged horse), Frey (Norse fertility god), & the Tomte (a Norse Land Spirit known for giving gifts to children at this time of year). Santa's reindeer can be viewed as forms of Herne, the Celtic Horned God. A collection of 15 holiday songs celebrating the return of the light, and hope renewed for peace and community. 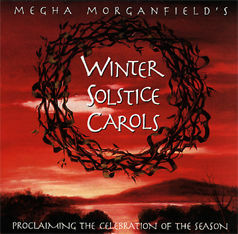 Inspired by Mary Daly's book "Gyn/Ecology", Megha Morganfield rewrote 12 tradition carols, retaining their melodies, but enlivening them with universal transcendent messages. 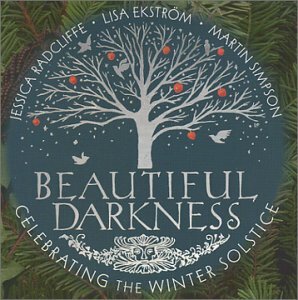 A collaborative production, the Winter Solstice Carols is a recording with harp, guitar, piano, violin and voice. A live recording of one of The Paul Winter Consort's legendary annual Winter Solstice Whole Earth Celebrations in New York City. A world music festival with 20 guest artists performing ancient & modern Sun-welcoming songs from all over the world including Celtic Galicia, Ireland, Russia, Native America, Africa, India & the Ecuadoran Andes, SOLSTICE LIVE! captures the adventure & drama of this musical journey through the longest night of the year. Perfect for multi-denominational family celebrations. 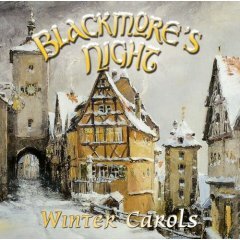 Richie Blackmore, Candice Night and their Renaissance rock band put together a lovely collection of Celtic and medieval inspired winter holiday music with this CD. As usual, Candice's heartfelt vocals and Richie's brilliant instrumental work shine particularly bright. Even though I personally celebrate Winter Solstice, their Christmas Eve is one of my favorites; the lyrics are multi-cultureal and it captures the spirit of this season beautifully. Winter, Lord of the Dance, Ding Dong Merrily On High, I Saw Three Ships and Ma-O-Tzur are are also standouts. Here are some of my favorite books on celebrating Yule and other holidays in communion with nature. and ritual for celebrating the seasons and cycles of life. Explore the Pagan & regional roots to many of our contemporary rituals & celebrations. and a December calendar listing traditions & rituals for every day of the month. This beautifully illustrated coffee table style book packed with folklore, stories, recipes, games, activities, decorating ideas, and songs of the Winter Solstice would make a beautiful gift. This is an excellent introduction to the ancient traditions of Yule for children. A beautiful retelling of 12 traditional tales... from North America, China, Scandinavia, India, Africa, South America, Europe, and Polynesia... that honor the magical moment of Winter Solstice when "the sun stands still." packed with seasonal recipes, crafts, ritual ideas & lore. Create your own family traditions! & lots of folklore & activities surrounding the Wiccan Sabbats for all ages. Learn to make beautiful holiday gifts for your friends & family... or yourself! This book features projects for all ages & skill levels and is beautifully illustrated. for the holidays or any time. The first and only planner specifically designed for young witches. & articles by well-known Pagan writers to enhance your practice. Two books in one. A history of Solstice celebration including Stonehenge, ancient Chinese, Mayan & Native American rites... followed by suggestions on creating your own personal seasonal rituals. The moon teaches us there always comes a time for self-renewal and new beginnings. Discover in the Lunaria luscious romantic era artwork and prose, an eclectic mix of classical literature, poetry, mythology, esoteric texts, folklore & charms. These treasures honor the Earth, Moon and Sky, as well as love, spirituality and humanity. The Lunaria utilizes thirteen true lunar months including a lovely depiction of each day's changing moon phase. Here you will find all the necessities of a traditional calendar and so much more! Included are traditional calendar dates with each month beginning with the new moon. This calendar provides information regarding which astrological house the moon is in, v/c and aspects, major planetary signs and aspects, traditional and earth holidays, rise-set times, quarter times, eclipses, solstice/equinox times, planet visibility, and, an informative user's guide. A classic. 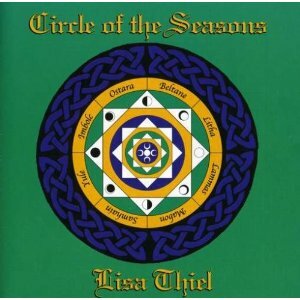 Includes Wiccan holidays, color correspondences, the best days to plant and harvest, the Moon's sign and phase, planetary motion including retrogrades, and solar and lunar eclipses along with practical tips, invocations, folklore, herb lore, and original scratchboard art by Kathleen Edwards. Inspiring paintings of the Goddess in her many guises by Susan Seddon Boulet. Another classic, with such beautiful imagery you'll want to keep it long after the year has passed. Brian Froud is an artist, conceptual designer for The Dark Crystal and Labyrinth, top-selling author, and a world authority on faerie lore. He has collected some of his most magnificent illustrations for the World of Faerie wall calendar. This spectacular sightseeing tour of faeries and their mystical universe will bring magic to your home all year round. drawing upon fantasy, myth, dreams, shamanism and mysticism. of the divine forces present in all aspects of nature. you'll love this uniquely beautiful calendar. This calendar is packed with astrological information to plan the year wisely. You'll find horoscopes, best days for planting and fishing, rewarding and challenging days, and travel forecasts by Bruce Scofield. There's also an astrology primer to help beginners use the vast amount of astrological data contained within. Comprehensive and practical, with original artwork by Stephanie Pui-Mun Law, the creator of the Shadowscapes Tarot. 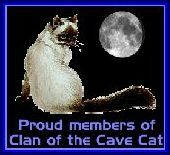 My own collection of handcrafted jewelry includes Victorian, Egyptian and stealth Pentacle necklaces, Triquetra Moon jewelry featuring Celtic knotwork, & and tributes to the Cat Goddess Bast including Winged Cat designs and Egyptian pentacles. There's also a section on crystal healing & gemstone magic.